Mumbai is resonant with Lord Ganpati’s immersion processions on alternate days! It sure is festive time in my city. I have some travelling to do from tonight till Saturday so going to miss out the tenth day celebrations! Off to Bangalore this evening to be with a big multinational company involved in food processing industry for an immersion day, the whole of tomorrow, understanding what they do, how they do it before I begin my work with them. So, then on early Friday morning, that is Sept 28th, a smooth ride of about 4-5 hours by road to Nasik, the ‘grape city’ which everyone first and foremost associate with Shirdi. I have a live interactive show for the audience of Dainik Divya Marathi. It is being held at Hotel Express Inn situated at Mumbai-Agra Road, Pathardi Phata. Quite a central location and I start at 2.30 pm. What’s the plan? Fusion recipes like I said but just to get the appetite whetted something with pasta, some thing to do with pav bhaji and cake and pizza! Innovating desserts like Motichoor Phirni and a novel Pav Bhaji Biryani awaits you! It will be a creative, interactive and fun filled time on stage! Entry is by invitation only. From Nasik off to Delhi straightaway! Attending the TiEcon Delhi 2012 on Saturday 29th Sept at Hotel Taj Palace. TiEcon is one of the world’s largest conferences for entrepreneurs operating on their motto of ‘Entrepreneurship – Thriving in Chaos’. I have a special slot from 2.15 pm to 3 pm in what they call the Rapid Fire session titled ‘Profit and pride – Brand stories’. It will be an interactive, informal and engaging 45 minutes in which I am free to relate my experiences and anecdotes from my entrepreneurial journey. Then in the following half hour I have to give a keynote address on my personal entrepreneurial journey – great platform to share my key moments in hindsight, what has impacted me, best memories etc. I have to condense my life’s journey in a capsule of 15-20 minutes and have some serious script writing lying ahead for me! So as I go back to that file on my computer let me wish you all a Happy Anant Chaturdashi! Two to three months prior to the day of Ganesh Chaturthi, a huge life-like model of Lord Ganesha is made, the size of which might vary from three-fourth of an inch to over 25 feet. The idol is placed on elevated platforms in homes or intricately decorated outdoor pandals or tents on the day of the festival, for people to view and pay their homage. The ritual of pranapratishhtha is carried out by a priest who is usually clad in red silk dhoti and shawl. He also invokes life into the idol of Lord Ganesha amidst the chanting of mantras. The shhodashopachara or sixteen ways of paying homage follows just after this where coconut (nariyal), jaggery (gur), twenty one modaks, twenty one durva blades and red flowers are offered to the Lord. The number 21 signifies the five organs of perception, five organs of action, five vital airs (pranas), five elements and the mind. Lord Ganesha’s idol is also smeared with red sandal paste or the rakta chandan. All throughout the ceremony, chantings of Vedic hymns from Rig Veda and Ganapati Atharva Shirsha Upanishad and Ganesha Stotra from the Narada Purana are done. After ten days, that is on the eleventh day, the Ganesha idol is taken through the streets in magnificent processions alongwith singing, chanting and sancing to be immersed in a river or sea that symbolizes the ritual of see-off of the God in his journey towards his abode in Mount Kailash while taking away with him the misfortunes of all man. A final offering of coconuts, flowers and camphor is made and the idol is finally immersed in the waters. Tinkling of bells and chants of ‘Jaidev Jaidev Jai Mangal Murti, Darshan majhe man kamana purati, Jaidev Jaidev’ heralds the arrival of the elephant god, Lord Ganesh, into the homes of his devotees. The melodic chanting of ‘Om Ganeshaya Namaha’ marks the beginning of any ritual in the Hindu religion. Lord Ganesh is the epitome of good luck who removes all the obstacles lying in the path of his devotees. He brings prosperity to his worshippers and keeps natural calamities at bay. He is the lord of all that is auspicious and successful and His blessings are invoked before starting anything new. He and the little mouse that is always with Him as His vahan (vehicle) are ideal examples of a balanced life, of how two opposites can co-exist peacefully and harmoniously. Ganesh festival lasts for nearly a month in the city of Pune with a lot of cultural programmes organised by eminent artists, musicians and dancers. It is a multi-cultural platform for artistes to offer their art and invoke blessings at the feet of the Lord. As this is done on a fairly large scale, a number of Ganesh associations have been formed not only in Pune but throughout the state of Maharashtra. In Hyderabad under the Nizam’s rule, many Maharashtrians held high administrative positions. The Ganesh festival celebrated by them as a social ceremony thus sprouted roots in Andhra Pradesh. And today, this tradition continues. The unique feature of this festival in Hyderabad is that the artists making the idols of Ganesh compete with each other to make magnificent, tall and elegant idols. If in Khairatabad (in Hyderabad city) at the time of Ganesh festival, look out for the largest Ganesh idol. It’s difficult to miss anyway as sometimes it scales more than 30 feet in height! 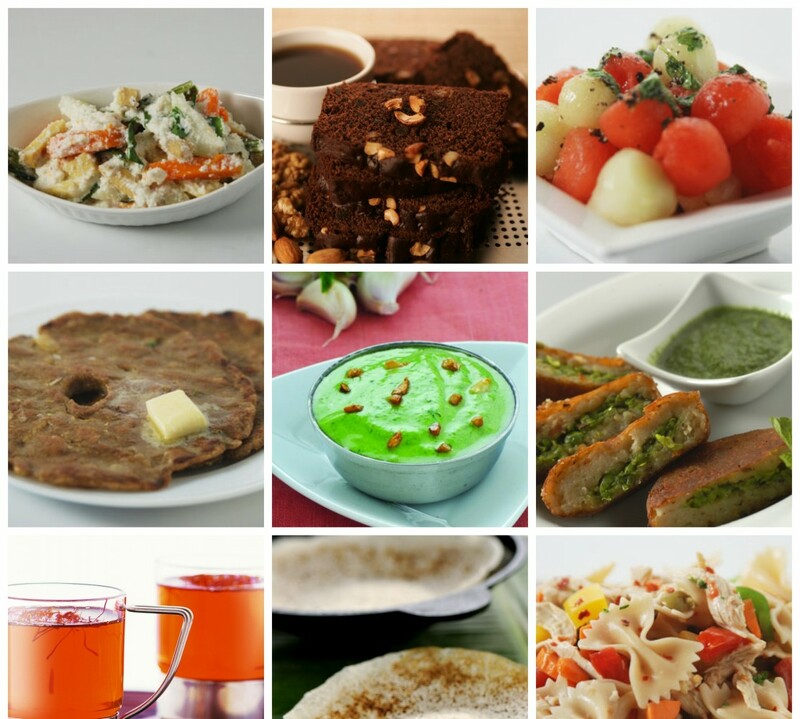 Savour these dishes this year and make it an absolute treat on Ganesh Chaturthi. It’s a golden jubilee for IHM, PUSA! In New Delhi, for celebrating my Alma Mater at IHM, PUSA that has completed 50 glorious years of imparting hotel education. It’s a proud feeling to be a part of the grand celebrations that began yesterday and will go on till today, to mark this half century! A get-together and gala dinner is awaited tonight at one of the most posh hotels in New Delhi. Pretty thrilled and nostalgic with the entire happenings going in here. It’s always a great feeling to come back to the place and meet with people who have, in some or the other way, inspired and motivated me to become what I am today and reach to this pinnacle. I would really like to thank all of them from the bottom of my heart! While in office – it was Innovation Station – Season 5 yesterday with a surprise and twist this time! It was just another usual day when all the chefs had come to work without knowing what was there in store for them. Finally, they were given the sweet shock – it was competition time where the team of chefs were given surprise ingredients with which they had to cook one dish. The ingredients were ranging anything from fruits to vegetables to poultry and others. Two chefs individually were given fifty minutes each, in which they had to dish out one recipe, as innovatively and as quickly as possible but with finesse. Chef Harpal Singh Sokhi did the honours of tasting and declaring the winners. 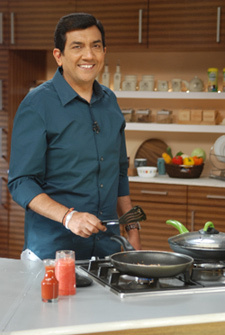 He gave some insights as also his ideas of what he would have done with the ingredients given to the contestants. He suggested that before starting to cook with any surprise ingredients, the first ten fifteen minutes should be used to write down the combinations, the possibilities, the mix and match of flavours and then to also draw out the presentation of the dish. Quite exciting an event, I must say and I’m sure all of them brought that extra edge and zeal out and put their best foot forward! Runner-Up was Chef Jaaie with her dish Quinoa and Asparagus Soup with Floating Islands with the main ingredients quinoa, asparagus, eggs, basil leaves and shallots. Events like these make the workplace more and more interesting and fun and I really feel that such things are great morale boosters and make each individual confident about themselves. Besides this, we all got some exciting new dishes – what’s better than that! Enjoy the visuals and the recipes shall soon be uploaded on the website. Everybody eagerly waits for decorating the Ganesha idol and celebrating the festival every year with great enthusiasm. But, what we all mostly forget every time, amidst the festivities is that there is a serious impact of this festival on the environment due to immersion of idols and other related things. Chemically made idols cause water pollution, killing marine flora and fauna, which indirectly reaches to us, through various mediums. The use of thermocol and plastic in pandals as well as for garlands and other decorations increases non biodegradable waste. Say no to idols that are made of chemicals, plaster of paris, clay, plastic, thermocol, etc. Instead, go the green way with natural options like idols made of biodegradable materials, unbaked clay, coconut, paint with natural colours, etc. See that the size and number of the Ganesha idols are limited in your community. Limiting the size to 5 feet is the best that you can do, as bigger idols consume more making materials, are difficult to immerse in water and also cause traffic congestion and difficulty in transportation. Save energy and electricity by replacing traditional bulbs with CFL’s and other energy-efficient lights. Also, make sure that the decorative lights are switched on only when required, for instance, at the time of aarti, puja or in the evenings. Use natural and biodegradable colours, such as turmeric powder, henna (mehendi), rice powder, gulal, etc. for putting up rangolis. These are eco friendly as well as unique. Also, making natural decoration from cloth, wood, paper, etc. is advisable than using non-biodegradable materials like thermocol. Use cloth bags, paper bags and banana leaves instead of plastic bags and plastic sheets for offerings, prasad, fruits, etc. These are not only comfortable to carry and biodegradable but can also be reused later. Set a proper time in which speakers and microphones should be played, that is, between 6 a.m. to 10 p.m. and make sure that people abide by the rules. This will help tackle the issues of noise pollution. Also, avoid playing loud music on loudspeakers and bursting of firecrackers. Limiting the number of public pandals is a great thing to do as it will not only bring the entire community under one place to celebrate the festival, but also avoid the unnecessary noise, land and water pollution that arises due to celebrating the same festival at different places. A compost pit can be made for the organic material like offerings of flowers and garlands and other such materials. The compost material acts as a great fertilizer that can be used in your gardens. Dried flowers can be used to make natural colours or decorative paper for gifts. It so happened that Kuber, the wealthiest among the residents of Paradise, hosted a feast in honour of Lord Ganesh. It was a joyful moment for gourmand Lord Ganesh who feasted to an extreme so much that he felt his stomach would burst! Smartly, he tied a snake around his stomach and went to pay obeisance to his parents. With his tiny stature and rotund belly, he was unable to prostrate before his parents. When he tried to bend, he turned turtle. Watching the scene from the sky was the moon, who burst out laughing at the sight. Goddess Parvati became livid at this ridicule of her beloved son, and cursed the moon that whoever saw him on Vinayak Chaturthi will be accused of a wrongdoing. Another version of this story narrates that Lord Ganesh fell down from his vahan (the mouse) much to the amusement of the moon, who burst out laughing inviting Goddess Parvati’s wrath and her curse. Goddess Parvati’s curse is so powerful that it did not spare even Lord Krishna. A story has it that he was accused of stealing a very precious gem called Samantak Mani. The possessor of this stone is said to acquire tremendous prosperity and it belonged to Satrajit. Lord Krishna, who was born and brought up as a cowherd, while milking his cow on the Bhadrapad Chaturthi day, accidentally saw the reflection of the moon in the milk. As he wondered what disaster awaited him, he was accused of stealing Samantak Mani. In reality Jambavant, a bear, had found it in the forest and thinking that the shining gem would please his little daughter Jambavanti, had hung it over her cradle. It was only after Lord Krishna traced the gem to the forest and brought it back after a battle with Jambavant that he could prove his innocence. From then on, to avoid the evil effects of the curse, Goddess Parvati declared that those who worshipped Lord Ganesh, especially on the Bhadrapad Chaturthi day and listened to this story would not be affected by the curse. Please the God and savour these delicious mithais on this day. The states of Maharashtra, Goa, Karnataka and Andhra Pradesh celebrate Ganesh Chaturthi, the birthday of Lord Ganesha, which is one of the most joyous events of the year. This festival falls on the fourth day of the month of Bhadrapad (coinciding with the English months of August/September). A beginning of a period of fun filled devotion to the lovable Lord Ganesh, the celebrations come to a climax in ten days subsequently. On the tenth day – Anant Chaturdashi – colourful and multi-varied idols of Lord Ganesh are bid adieu by immersing in flowing waters. Chants of ‘Ganpati bappa morya, phudcha varshi loukar yaa’ (‘Farewell, Oh Lord Ganpati, come soon next year’) fill the air and the earnestness of devotion is to be seen to be believed! Talking about the legend that is attached with this festival, there are some interesting mythological stories that reveal the birth of Lord Ganesh and how He came to be made the Supreme God. According to one legend, Lord Ganesh was considered as the creation of Goddess Parvati, who breathed life into a doll shaped out of her scarf. Another legend has it that Lord Ganesh was born to Lord Shiva’s wife Goddess Parvati when Lord Shiva was deep into tapasya (meditation) on Mount Kailash in the Himalayas. Goddess Parvati was with her parents at Kashi at the time of her child’s birth and she did not inform her husband about the birth of Lord Ganesh nor did she tell her son about his father’s identity. One day while bathing, Goddess Parvati asked her son to stand on guard and not to let anyone in. Just then Lord Shiva returned from his tapasya and wanted to meet his wife but little Lord Ganesh, not knowing that it was his father, would not let Lord Shiva in. This angered Lord Shiva so much that he cut off the little child’s head. The commotion brought Goddess Parvati rushing out only to see her beloved son’s head chopped off by her husband. On realizing what he had done, a horrified Lord Shiva promised his wife to bring their son back to life by placing the head of the first living thing that came his way. And it happened to be an elephant. A son with the head of an elephant further dismayed Goddess Parvati who felt that no one would pay any attention or worship Lord Ganesh. Lord Shiva then declared that Lord Ganesh would be worshipped first before any other God or Goddess. This angered the other Gods who complained about it to Lord Brahma. But the Lord did not entertain them saying that Lord Shiva (also known as Mahesh) was one of the trinity (Brahma, Vishnu, Mahesh) and the three of them held each other as equals. Only Lord Shiva could alter his verdict. So the Gods then went to Lord Shiva and asked him to test their intelligence before declaring which God should be worshipped first. The Lord, who believed in playing fair, agreed and asked them to go round the world in their vahans (vehicles) and said that whoever came first would be the one to be worshipped first. The vehicles of all the other Gods were faster than Lord Ganesh’s, whose vehicle was a mouse. So, happily they started out, confident that Lord Ganesh on his mouse would be the last one to complete the race! Lord Ganesh circumambulated his seated parents on his mouse declaring they being Supreme were the ‘real world’. The other Gods could not dispute this and agreed that Lord Ganesh was certainly the most intelligent of them all! Ever since, before any religious function or auspicious occasion like marriage or inauguration, Lord Ganesh’s name is invoked with devotion.